Comic book conventions have become big, bloated masses of multimedia entertainment. 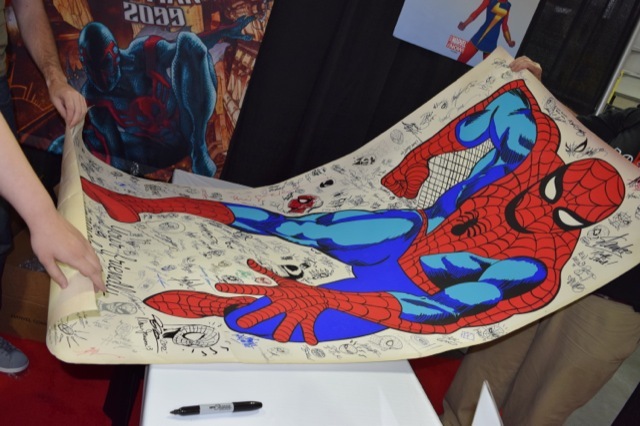 Movies, books, television, video games and every other form of mass media entertainment overshadow the comic books for which the conventions are named. This past weekend, the folks at Reedpop, who run the New York Comic Con in October, put on Special Edition NYC, a stripped down show that was exclusively about comic books. Special Edition NYC was located in the north hall of the Jacob Javits Convention Center, an area usually reserved for a small part of the New York Comic Con. Walking the hall to the hallway to the north hall seemed desolate compared to the 130,000 people that attend the NYCC in October, but it led to a line of Batman standees lining the hall by the doorway and a dj spinning tunes that could be heard up near the entrance inside and out. The front third of the hall was dealers selling comic books, toys, and representing different comic book publishers. Beyond the commerce laid the artist alley, where it was lane after lane of comic book artists, writers, and other assorted people who create the four color books and their related arts. Walking the aisles, the difference between this convention and its larger sibling in the fall was apparent. Walking between the rows of tables was much easier and there was room to stand without being bumped when looking at an artist’s table. It was much easier to stop and talk to the artists and find out about their craft and talk about the work they’ve done. Some of the bigger name artists and writers had lines for their tables, but the Special Edition NYC staff were able to keep it orderly and stop it from blocking the aisles. On Sunday, I stopped into the Marvel Unlimited panel and got to see some upcoming art for their upcoming comics – and learn that the comic book characters were sad. Even though the room was only half to two-thirds full, it made it a bit more intimate. We were able to ask anything we wanted to Ryan Penagos, Marvel’s Executive Editorial Director of Digital Media, before the panel and although we weren’t able to get him to reveal any upcoming information that wasn’t already in the public domain, it was cool to hear someone from “The Big Two” giving us honest behind the scenes information. The most glaring omission from Special Edition NYC was DC Comics. With the exception of some Batman standees and a couple panels, there was no presence from one of the big two publishers. Marvel Comics had a very stripped down booth compared to the larger conventions, and smaller publishers like Valiant, Devil’s Due, and Archie had booths as well, but the lack of DC was very much obvious to attendees. Without the flashing lights, big media, overshadowing cosplay (although there were some cosplayers there), and other distractions, it was nice to go to a comic book convention that was focused on its namesake rather than all the other ephemera that surrounds it. It was reminiscent of the conventions that took place in church basements, hotel ballrooms, and high school gymnasiums in decades past. The consensus was that Special Edition NYC may never be as large as the New York Comic Con, it is a much needed convention that everyone I spoke to hoped would continue on for years to come.